A variation on the original best-selling Dark launched in 1974, the Light is an excellent alternative for players who may find the Dark a little too ‘covered’. Particularly suitable for the contemporary or jazz saxophonist, this ligature is free-blowing, and produces a responsive, lively sound. 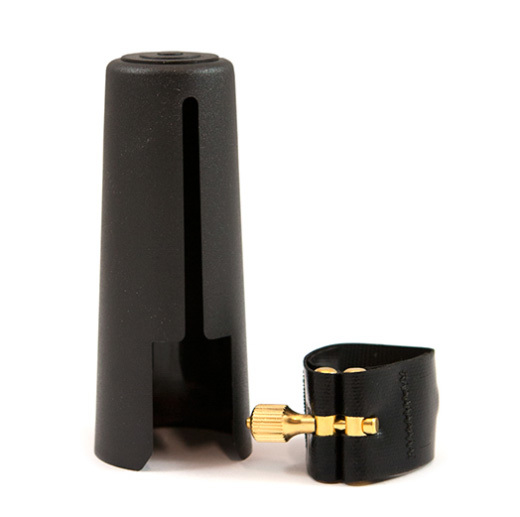 This ligature offers a full range of musical expression for jazz improvisation, so is designed ultimately for the player desiring a more contemporary sound. The body of the ligature is made of a flexible neoprene/polyester fabric, that will not stretch or rot, and is chemically impervious. The single adjusting screw, which is corrosion-resistant, is designed to reduce the time and hassle of adjusting traditional ligatures. Anyone looking for a responsive, lively sound, at an affordable price, should definitely consider this Rovner ligature for their baritone saxophone playing.